Erma V. (Rutherford) Lawson, 98, formerly of Dixon, Illinois passed away on January 9, 2019 at Signature Healthcare in Muncie, Indiana. She was born on February 17, 1920 in Iuka, Illinois, the daughter of Floyd and Cleo (Henson) Rutherford. She married Donald C. Lawson Sr. in 1937 in Belvidere, Illinois. Erma and Donald lived in Dixon, Illinois for many years. Erma moved to Muncie, Indiana shortly after Donald’s death in 1991. Erma was a loving wife, mother, grandmother and great-grandmother, always willing to lend a hand to anyone who needed her. 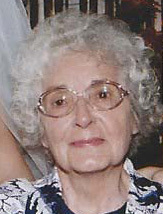 She was a member of First United Methodist Church while living in Dixon. Survivors include her son Donald C. Lawson Jr. of Altamonte Springs, FL; her daughter Leta Stewart (Richard) of Rockton, IL; seven grandchildren, one step-grandchild, eleven great grandchildren and one great, great grandchild. She was preceded in death by her parents, her husband and her son Kenneth D. Lawson (Patti). Arrangements are being handled by Chapel Hill Funeral Home in Dixon. Private graveside services will be held at a later date. Memorials may be sent to First United Methodist Church of Dixon or the Prism Project, Ball State University, Muncie, IN.